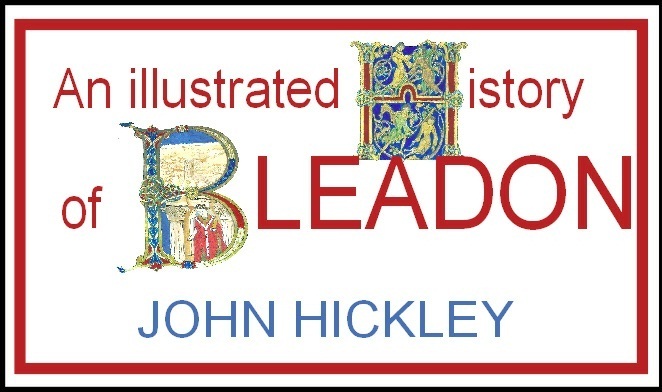 Local author and illustrator John Hickley launched his 'History of Bleadon' book on Sunday 28th October 2012. A limited edition of two hundred signed copies were printed and sold. At the original launch in the Coronation Hall, Bleadon. All were welcomed between 12 and 2 pm to share in celebrating the final stage of this project, where fifty original paintings that form the illustrations were also on show. Please Note: Unfortunately all copies of this beautifully illustrated hard back publication have now been sold with no plans for a further print run. However, John has kindly agreed for BOB to make available an electronic downloadable version of the book for £5 (see images below). How far back can history reach? What could have happened in a village like Bleadon? Reindeer grazed on Purn Hill at the end of the last Ice Age when few trees grew. 'Bleadon Man' lived here 100 years before Christ. Roman invasion was followed by savage raids from the Danes and a tale of stubborn retalliation by one of the older inhabitants. The village was first mentioned by name in 956. A hundred years later it was given to the monks of Winchester by Gytha, the mother of the unfortunate King Harold. In the Domesday Book, Bleadon was much more valuable than Westminster. In 1540, Bleadon's parish priest was one of three hanged at Smithfield for denouncing Henry VIII's divorce. There was violence in the vicarage too. The village priest was murdered by his own brother. A more fortunate Rector discovered the Bleadon Cavern, filled with ancient animal bones, wolf, bear, bison and some six foot tusks! A tsunami caused 200 square miles of flooding in 1607. Much effort has been spent over the years in preventing sea water ruining the land; the old sea wall, an innovative windmill in 1613 and eventually floodgates in 1808. There are also personal stories of courage, disaster, endeavour and invention throughout the centuries by villagers,hundreds of whom are named on the endpapers of the book. Many more will remain forever anonymous. Bleadon's history may only seldom relate to that of the nation, but it is good that we should know something of what happened here, and what our predecessors in the village endured, enjoyed and achieved. "The idea for this book occurred to me about three years ago. Fifty subjects were eventually chosen from information available, and which would make suitable illustrations. Research sometimes proved difficult or sparse, other times more could have been written had space permitted. These events and people of the past formed our history, the foundation and framework of Bleadon today and learning about them was intriguing. With imagination, history became revealed in the village and the surrounding hills. If my illustrations can start the process in others, my time will have been well spent. I would like to thank those who encouraged the book, and those who support its sale." Below are a selection of images taken from a pre-publication draft of the 100+ page illustrated book. Please feel free to browse through the images below, you can click on any image thumbnail to expand it. A PDF copy of these images is available to download for £5. For more details of how to obtain a copy please contact us. Please remember, all images published on BOB are copyright. Should you wish to reproduce any of them please obtain the consent of the copyright holder before doing so. You may also be interested in John's new book 'LOOKING UP Weston-super-Mare'.